Some 30 ships with an average capacity of 11,700 teu will be replaced by larger newbuild tonnage on the Asia-Europe and transpacific tradelanes this year, according to ClipperMaritime’s cascade model update. Ocean carrier vessel planners will be tasked with finding new employment for these larger containerships, which could prove difficult due to port restrictions and frequency requirements on many smaller trades. Moreover, carriers are well aware that freight rate levels can be destroyed overnight by an influx of extra slots on a hitherto well-balanced tradelane. The London-based consultant notes that, of the 30 ships earmarked for replacement, 20 are operated by Ocean Alliance partners and five each by members of 2M and THE Alliance. According to ClipperMaritime data, the average size of vessels plying the Asia-North Europe tradelane now stands at 14,824 teu, the largest being 21,413 teu. Some 13 18,000 teu and three 14,000 teu newbuilds are stemmed to enter the trade in the second half of this year, cascading-out ships in the 14,000-16,000 teu size range. Meanwhile, between Asia and the Mediterranean, although the average size of ship deployed is 10,791 teu, the consultant notes that the trade is set to receive a further seven newbuilds of an average 14,000 teu, before the end of the year. Five of these are for the Ocean Alliance and the other two will be operated by members of THE Alliance. On the transpacific, the average size of the vessels deployed between Asia and the US west coast is still relatively small, at 7,762 teu, but the largest vessels now being deployed are around 14,000 teu. The average size of ships on Asia to US east coast services is similar, at 7,648 teu, with the largest ships currently 14,414 teu. 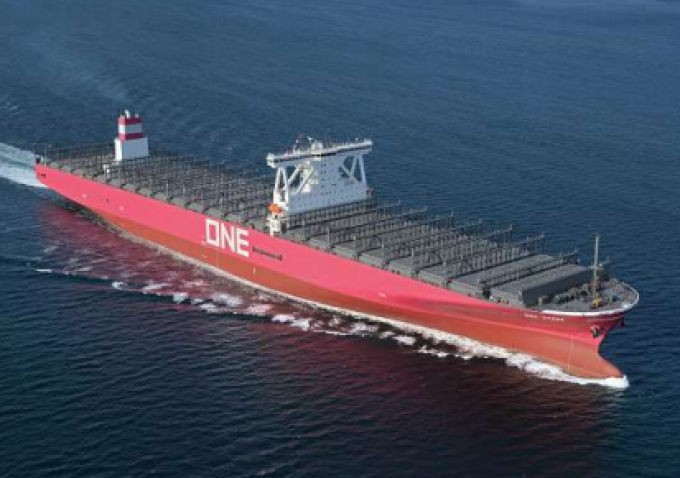 And it was announced this week that the Japanese carrier ONE’s much-heralded first newbuild, the 14,000 teu ONE Stork, would be deployed on the EC4 loop of THE Alliance’s Asia to US east coast network, via the Suez Canal. It was originally to be deployed between Asia and North Europe, evidencing the development in ship sizes since the vessel was ordered by NYK in 2015. Notwithstanding the cascading impact in the bigger sizes, at the other end of the scale, small containerships are in big demand as a consequence of several years of rampant scrapping and a dearth of new orders. Fast-growing feeder containership specialist MPC Containerships has built up a portfolio of 68 smaller ships, from 1,000 to 2,800 teu, which are all employed, mostly fixed with ocean carriers at daily hire rates significantly in excess of operating costs.